If you are thinking about becoming a yoga teacher and sharing your joy of the practice with other, this is your chance! Or maybe you want to enrich your life with deeper insight and meaning into this transformative practice. Deciding to take your yoga journey to the next level is truly a life-changing decision. You are taking not only your passion but your heart and soul on a journey that will deepen your yoga practice for life! Come and enjoy an amazing transformation! You will be living and practice at the gorgeous Villa Xochipilli in Melaque, Mexico. Villa Xochipilli is a private villa set on two and a half acres of land, bordering the beautiful Laguna del Tule. It is a great place for tropical bird watching and for watching and observing the wildlife of the Laguna del Tule. The guest houses are private and surrounded by beautiful, colorful, and exotically tropical flower and tree gardens. It is a bird watchers paradise. As well as a paradise for flower and palm tree avid gardeners. There are 62 different species of birds in the lagoon and on the guest’s rounds, 20 different types of palm trees, and at least as many different types of tropical flowers for you to enjoy. A custom yoga studio has been recently been built that overlooks the lagoon. It is a stunning place to practice. Owner Irma Erazo resides at her home in Villa Xochipilli “Casa Luna”, she is totally bilingual-bicultural and very familiar and knowledgeable about all aspects of the Costalegre area. A yoga teacher and SOYA graduate, she is always glad to be able to provide you with whatever information you would like to have about the area. For your shopping convenience, there are several well-stocked grocery and liquor stores within walking distance of Villa Xochipilli as well as some of the most popular and best restaurants in Melaque, Taco stands, bars, and restaurants where you can sample either local or international cuisine and your favorite Mexican drinks. By attending a teacher training, you will find inspiration, purpose, and perspective through in-depth yoga philosophy and esoteric studies. This will help increase your awareness along with physical and mental healing, strength, stamina, and agility through each of the experiential classes you will do. With its roots in the Sivananda lineage, the training is inclusive of many styles of Hatha yoga such as Ashtanga, Sivananda, Yin, Restorative, and Vinyasa all while incorporating the study of yoga philosophy. This outstanding aspect of the SOYA teacher training embraces unity in all yogis, regardless of their paths and styles of yoga. Daily sessions include detailed instruction and practice in various styles of Hatha yoga, such as Ashtanga, Sivananda, Flow, and Yin. Morning and evening meditation, chanting, pranayama, along with group review and discussion will shed light on the written assignments in philosophy. You will design a series of six yoga lesson plans. This is a very detailed assignment covering benefits, precautions, and modifications for asanas, pranayama, and meditation techniques. You will practice and develop your teaching skills throughout the entire program. Upon completion, there is a written exam and practical exam. Graduates are eligible for registration with Yoga Alliance as RYT-200. Carla is the founding owner of Chinook Yoga in Prince George, British Columbia and the director within the Primary Faculty of the SOYA yoga teacher training program. She is an E-RYT 500 certified yoga teacher with over 17 years of yoga teaching experience in a wide range of styles from Yin yoga to Prenatal. Carla has been teaching in multiple annual teacher training and international yoga retreats since 2008. She has studied with Mugs McConnell, Shirley Daventry French, Erich Schiffmann, Shiva Rea, Rod Stryker, Dana Flynn, Minke de Vos, Geeta Iyengar and Christabel Zamor. Jeff is a member of the SOYA Faculty and a co-owner of Chinook Yoga. As an enthusiastic teacher of Hatha and Restorative yoga for the past seven years, he feels that yoga is an opportunity to connect with the profound power of nature that we see and experience around us continually and the intimate space where that power exists within. Melaque is located between Manzanillo and Puerto Vallarta along the Southern Pacific Coastline of Mexico. The climate here is close to that of Hawaii or Jamaica, so rest assured, this is an ideal winter destination. It is a tropical paradise with stunning sunsets nearly every night. Melaque boasts a population of around 8000, which is generally associated with the three small villages: Melaque, San Patricio, and Colonia Villa Obregon. Melaque is more geared towards tourists and furthest west, San Patricio is more for business and in the middle, and at the furthest east is Colonia villa and is mostly residential. Several dinners will also be served. On other nights, you will have a chance to explore some of the wonderful and inexpensive restaurants in Melaque or cook at the villa. Throughout Melaque there is a wide range of restaurants and vendors to pick from as well as many well-stocked grocery stores. Please book your flights to arrive at Playa de Oro International Airport (ZLO) in Manzanillo, as this is the closest airport. You can also fly to Licenciado Gustavo Díaz Ordaz International Airport (PVR) in Puerto Vallarta but will need to take a four-hour bus south to Melaque. 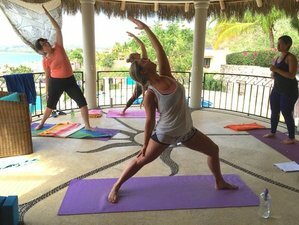 Carla Wainwright Yoga offers yoga retreats to help you find true pleasure in practice and use that power to heal, transform, and awaken to a life of freedom.